Editors’ Note: Dear Baseball Gods: A Memoir is available today from all major online booksellers. Dan Blewett, one of our own here at Elite Baseball Performance, wrote the book, and we wanted to sit down with him to talk about his work, the process, and how it will help those who read it. Links to buy a copy are at the end of the article, and you can sample the first chapter here. First, can you tell us what Dear Baseball Gods: A Memoir is about? Sure! The format of the book is unique—each chapter is written as a letter to a person, conveying a piece of my story that I felt was useful, meaningful, and impactful to them. I chose this format because when I retired, I wrote my parents a letter thanking me for everything they did to help me along. The book starts on the day I learned I needed to undergo Tommy John surgery for a second time, then backtracks to my youth, finally catching back up to the present day when I retired, then expanding on the grieving process we athletes go through as we exit that phase of our lives. You can read (or listen) to this first chapter here. I was a walk-on at a small Division-I school that you probably haven’t heard of. The day I signed to play college baseball, a clock started ticking: I had four years to go from mediocre to great, because I did not want to stop playing baseball. Two Tommy John surgeries later, I was still playing, still fighting to make it to the Major Leagues. As I navigated Independent Baseball, ruthless coaches, a team that collapsed due to non-payment of our salaries, getting cut and released, and suffering through constant arm pain, I grew up. I was an ordinary, average-sized right-handed pitcher who got a lot more years in the game than he should have. What compelled you to write Dear Baseball Gods? Well, I actually wrote what I thought was this book back in 2012. That summer, I wrote something like 80,000 words—a solid, full book’s worth—as I waited for surgery on the disabled list. Writing has always helped me sort things out, and what I wrote that summer ended up just being practice, though I referred back to it a few times. At that time, getting a second Tommy John was exceedingly rare. I knew that twist really made my story different. I had already undergone a big transformation to that point, and the second surgery was yet another major obstacle. I hoped I could help others one day keep pushing through their own tough times. What are the major themes in the book? The book is much more than just recounting games, situations and my growth as a player. One major theme is the battle with the voice in my head that often bullied me to keep moving. I owe a lot of my success to that voice, but also a lot of pain. We athletes are in a constant state of battling the angel and devil on our shoulder, and there is a lot of that in the book. Much of it is about re-framing bad situations. I made it through tough times because I found the bright side in many of them. As I look back on it all, I’m thankful for all of it—the amazing highs and the depressing lows. It made me who I am today. The biggest theme, though, is personal identity. I wrote the book when I was grieving the death of my career, and the last quarter of it is about my transition out, something athletes almost never talk about. It’s very candid and honest, and it will resonate with people from all walks of life. Anyone who has ever tied their identity up in their career, just to lose their job and move on, will relate. What prepared you to write a book? It’s no small undertaking! This is actually something I discuss in the beginning and end—how we grow into different skills over time. I was always a good writer in school and chose to double-major in Philosophy & Psychology in college. I wrote my first book in 2013 and that broke the seal, so to speak. In pro ball, I began journaling on bus rides, as writing helped me make sense of my world. I’ve also been blogging since 2008 and wrote freelance for a number of fitness websites for extra money throughout my playing days. Minor leaguers make almost nothing, so a little extra cash always helped. I became a decent ballplayer slowly, over time. I became a writer in the same exact way—”practicing” through years of writing in school and on the web. Really, though, my background in Philosophy helped the most. It shaped how I perceive the world, how I form thoughts and find meaning in my life. The book is very philosophical, with a lot of deep discussion on the nature of why we athletes do what we do. Anyone with a connection to an athlete, who wants a better understanding of what the journey is like, what an athlete will go through. Parents, coaches, athletes, baseball wives and girlfriends—all of these people will learn more behind the scenes, insider information that we players don’t often share. I have an atypical story but am typical in that I kept a lot of the hard times to myself—my family learned more about me in the eleven hours it took to read through this than they probably did in the previous three decades. And, the book is as much about others as it is about me. I tell the stories of a number of teammates who changed my perspective, as well as the stories of countless mentors who made me who I am. For parents who want to know how they should be supporting their children, my story is a must. For players, they’re going to get the very real, authentic version of what it’s like to give their heart to a sport. Want to know what good parenting looks like? It’s in the book. Want to know what good coaches do to change a young person’s life forever? It’s in the book. It’s about much more than baseball. What’s it like putting out such a personal story? What’s the scariest or hardest part? I thought little of it until the final month. Then, I started to panic. It’s exactly like jogging out there between the lines or walking onto the stage. Everything is easy, everything is clear until the spotlight and all eyes focus on you. I talked about this in a recent episode of my vlog. If the book wasn’t genuine, or personal, I probably wouldn’t feel anything. I never got nervous pitching in games that didn’t matter. Yet, I talk openly about a lot of topics that don’t make me look macho, that athletes sweep under the rug. I’m not aware of other books that have talked so much about the grieving process, the threat to personal identity that comes when a lifelong athlete hangs up his or her cleats. This book is my whole career arc—rise and fall. In my last season, I watched my career die right in front of my eyes, my dreams flow down the drain. It was hard living it and hard writing it. The reason I wrote this is because these things need to be talked about. I felt them; they exist. Athletes need to stop acting like it doesn’t hurt when we walk away after two decades chasing our dreams. I wanted people to know what it’s really like to give your heart to your career, just to have it broken in the end. That is why as launch date approached, I got more and more nervous—I was about to go out onto the stage and do a dance that no one had done before. Where can people get a copy of Dear Baseball Gods: A Memoir? It’s available pretty much everywhere online starting today. You can sample the book on audio below. Amazon or Danblewett.com are the only sources for paperback copies. This book is closure on my career, and I know it will help parents, coaches and players to better understand what a life in sports does to a kid. It’s amazing, it’s hard, and it shapes your entire life. The audiobook version is launching soon, and you can sign up for my email list here to get notified the day it launches. It will be available on Audible, Scribd, Overdrive and anywhere else you listen to audiobooks. 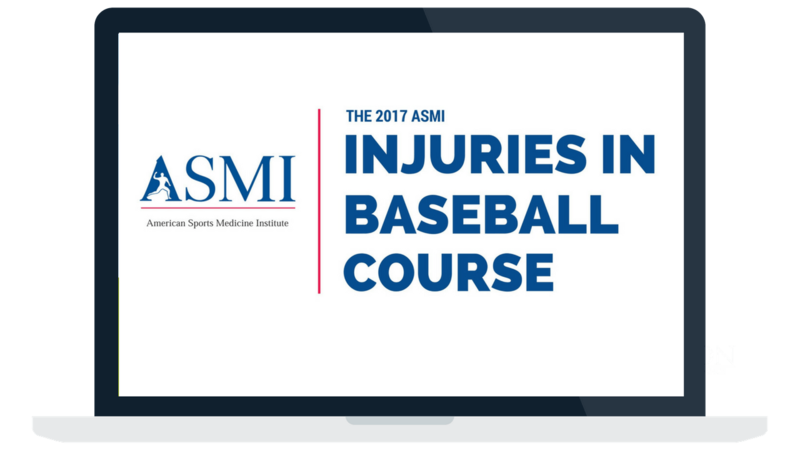 Elite Baseball Performance is excited to announce that we have just released the exclusive online version of the 2017 ASMI Injuries in Baseball Course. Learn from the leading experts in baseball sports medicine! The American Sports Medicine Institute has been conducting their annual Injuries in Baseball Conference for 35 years under the direction of course co-chairmen Dr. James Andrews, Dr. Glenn Fleisig, and Kevin Wilk. This is the longest running and most prestigious scientific conference dedicated to the care of baseball players. The online version of the conference contains a collection of presentations from the event earlier in the year. This is the most cutting-edge information available on on baseball injuries. The 2017 course is the premier conference for baseball related injuries and performance enhancement. And with the online version, you can access the course at anytime, from any device, anywhere in the world with internet access! To celebrate the launch of the program, we are offering it for $100 off the regular price of $299. You can purchase the program for only $199 now through Sunday June 25th at midnight EST. Click the button below to learn more and purchase now!